The first of six encounter tables for the Foabeléth Ordirrex, the megadungeon beneath Booezor. But first a small overview. Minor Dungeons: The Foabeléth Ordirrex is comprised of many smaller minor dungeons, six of which connect to the surface. Booezor is built on older layers of its previous iterations, particularly the Ezordirrexian era when the city-state as one worked for the glory of the Autarch, and the elder magic era, when the Sculpted Mountain and the first city was built. Oldcity Sewer System – the functional and nonfunctional sewer systems of several iterations of the city built on top of each other. A huge mess of tunnels and chutes that spans more than twice the length of the city. Tomb of Mountain's Heart – its earliest parts were dug deep into the heart of the Sculpted Mountain, and the subsequent generational levels were stacked on top of each other one after another as the city grew. It occupies little horizontal space but a great deal of vertical space. Filth Pits (Refuse Dump) – the size of small town and with a population of people to match, the city's dumping grounds have become their own multi-leveled ecosystem and cave complex, eventually meeting the sewers or the twin underground helical rivers. Labrynthyne – a quasi-extradimensional prison structure built to contain magic users. It is filled with creatures that ignore, twist, or feed on magic energies, convicts to dangerous (or hated) to kill, and beings from other planes. Moonmetal Mine – silver IS magic in the “Furthest Lands”, not a currency. Occasionally silver or Moonmetal will rain down from the sky as meteorites. The most closely guarded mine on the lower slopes of Booezor's Sculpted Mountain was once a steady source of the magical metal. Giant Termite Mound – a great nest of giant termites at the base of the sculpted mountain is believed to connect to the deeper parts of the megadungeon. 1. Acidic Eels – man-length eels that coat themselves and potential predators in caustic mucus. 2. Hydromander Congress – one to two meter long blue shaded salamanders with various elemental water magics, intelligent and non-aggessive but cautious of people. 3. Throat Leeches – large black or brown leeches, seek the throat, nostrils, gills of hosts and turn purple-red with blood. 5. Vampiric Moss – inanimate hanging moss that drains the life force of a nearby creature after establishing a link, consumes a set amount of hp, and loses link when victim leaves its 30' area of effect. 6. Troggers - frog-like, small, amphibious tribal people with a nauseating bodily odor on land, known to eat anything they can fit in their overlarge mouths. 7. Sewer Monitors – S-M size amphibious monitor lizards with disease-inflicting bites. 1. Normal Large Water Rats – rats... just rats. 2. Pouch Rats – thieving rats that distract and take items from the distracted. 3. Plague Rats – diseased rats with rabid behavior. 4. Bristleback Rats – large, powerful and ravenously hungry. 9. Black Sneezers - a species of underground squirterhorse, they fire a wad of sticky, acidic mucus from their fused tubular jaws with a comical nasal sound. 10. 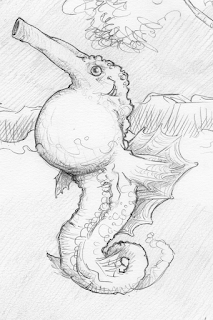 Cistern Wyrm – mutant offshoot of the river dragon family, pale, bloated, and craving legitimacy for their wretched lineage. 1. Merchant – often with contraband like exotic drugs. 2. Slaver – with slaves for sale. 3. Slaver – seeking slaves. 4. Debtmaster Priest – more powerful naga who owns the souldebts of others of its kind. 12. Sluice Hulks – huge amphibian monsters, like a predatory frog-hippo, low intelligence but trainable. 1. Slime – mostly immobile green dissolving slime. 2. Gel – as the 'Dragon Quest' OG slime monster. 3. Gray Ooze - clear, quivering, mobile gelatinous lump. 4. Slimenemones – poisonous, paralytic, or deadly terrestrial anemones. 5. Jelly Egg – immobile opaque goo balls, each with a different surprise inside. 6. Gelatinous Sphere – as the cube but spherical to fit the sewer system, significantly faster but has difficulty with turning. 14. Crocodile – your standard crocodile, patient, implacable, an ancient form of zoological perfection prepared to drown, crush, and swallow you. 15. Fasinaa Sluicedwellers – several groups of fasinaa saurians have made their homes in the sewer system that mimics the conditions of their ancestral home, they may be civilized folk or deranged cannibals. 16. Delver Group – a party of NPCs from the Delvers' Collective, going to or coming from a mission in the depths. 1. Purple Pipemoss – multi-use moss that can be burned for lighting, smoked for pain-relief, and is eaten by many sewer creatures. 2. Speckled Cupshrooms – the bitter liquid collected in the mushrooms upturned caps functions as a cure minor wounds spell, but also begins a half-hour mildly hallucinogenic experience. 3. Sewer Lilies – exquisitely beautiful water plants that release a sickly soporific odor when picked or worse, trampled. 4. Goostrands – softly glowing strands of viscous goo hang from the ceiling, when eaten they can cure many diseases. 18. Constrictor Snake – giant crushing snake, excellent at surprise. 19. Giant Fishercat – sinuous predatory mammal. 20. Slime Double – as the classic 'doppleganger', leaves a slimy residue on objects it touches as a tell. 22. Escaped Biomagical Experiment (chimera / mutant) – chimerical beast or a super-powered humanoid, seeking a hiding place in the sewer. "C'mon and give Grandpa a hug!" 23. 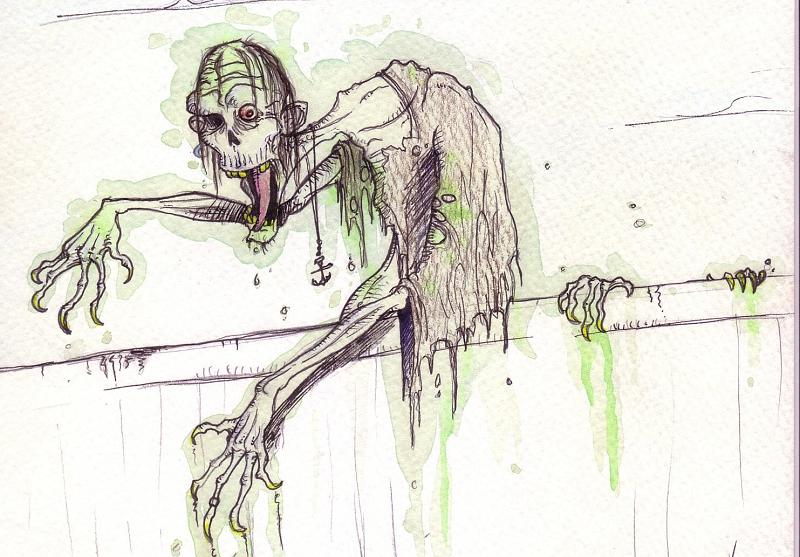 Waterlogged Zombie – putrid animate corpses with a nauseating stench. 24. Sewer Roper – blobby body easily wedged into any corner, with a beaked mouth in the center of up to ten retractable tentacles. 25. 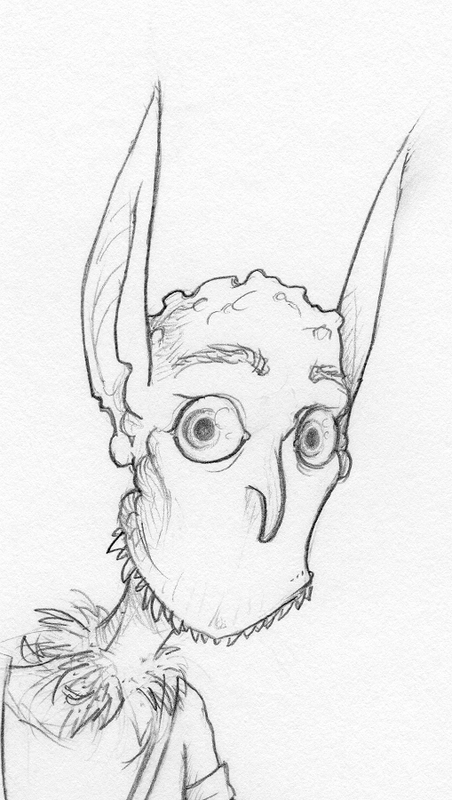 Shriekers - the classic alarm sounding, random encounter attracting, oversized fungus. There are over a dozen species, each with a distinct morphology, so they may look like: giant puff balls, tall thin mushrooms, brightly colored wall growths, etc. 26. Water Elemental – at work or lost beneath the city, its temperment will vary depending on how clean its component water is. 27. Crab Folk – generational nomads long lost on their pilgrimage to the Underground Sea. 28. Wisp Angler – huge-mouthed lunged fish with a glowing magical lure, 60% have 1d4 S-sized scavenging males living on their bodies. I love these encounter tables! Don't stop! Keep these encounter tables coming! Thumbs up!